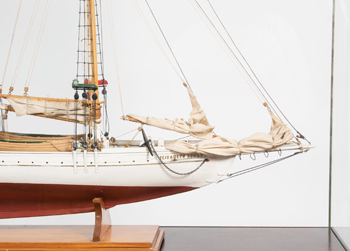 Model Schooner of Elizabeth Howard – We’re very pleased to have bought this beautiful model Schooner of Elizabeth Howard by Lewis H. Story on our recent buying trip. 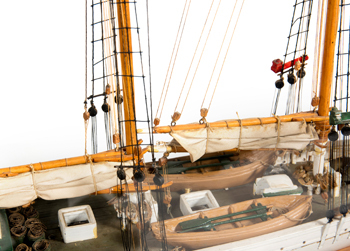 A magnificent example of 1920’s model making, Lewis H Story (1873 – 1948) was a leading local historian, shipwright and model maker in Essex, Maine, USA, and made it his life’s work to study and record the history of local shipbuilding, particularly the local Chebacco Schooners. The Essex shipbuilding museum contains much of Story’s archives and so respected was he, that a replica Chebacco Schooner, “The Story” was built by the museum in his honour. 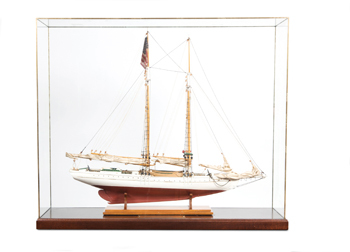 This beautiful cased scratch built model schooner Elizabeth Howard is finely executed complete with sails, lifeboats and rigging. 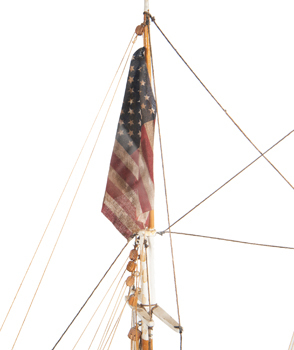 The original yacht was built in 1916 at East Boothbay, Maine by Frank C adams for Mr W.W Howard. 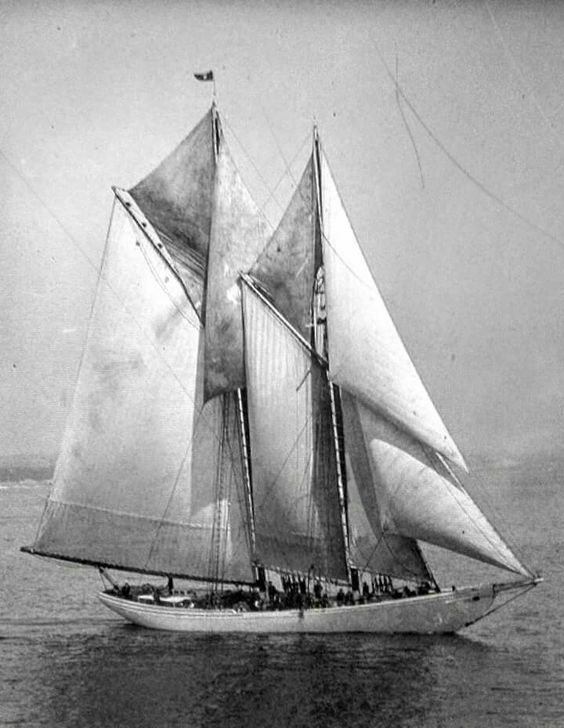 The model schooner Elizabeth Howard made by Lewis H Story 1919. It was the 12th March, 1923 when the original Sch. Elizabeth Howard, Captained by Daniel MacDonald, arrived in Halifax with the devastating news that they’d lost four of their own crew and 2 from the Helen M. Coolen to the ocean when they ‘shipped a lake of green water from leeward’. With their sail lowered to half mast, they described a tremendous battle against the sea and the loss of their fellow seamen. The disaster was described in detail by the below article from the ‘Out of Gloucester’, R. Sheedy. Elizabeth Howard Model Video – Don’t forget to increase your quality to 1080 in the settings button at the bottom of the video screen. Sch. Elizabeth Howard, Capt. Daniel MacDonald, limped into Halifax, N. S., yesterday forenoon battered, her flag at half-mast for the loss of six men , four of her own crew, and two from the ill-fated schooner Helen M. Coolen of Lunenburg, N. S., and 16 members of the Coolen on board. The famous fisherman, rival of the Henry Ford in the elimination races last autumn, brought in a terrible tale of the sea, of a battle with terrific seas in effort to escape disaster on Sable Island, the graveyard of the Atlantic. The men were lost and the Lunenburger foundered during the fearful blizzard of last Wednesday and Thursday. John McLeod, single, 42, of St. Peter’s, N. S.
James Murphy, single, 48, of Canso, N. S.
Miles O’Brien, single, 26, of Bay of Bulls, N. F.
Capt. MacDonald, skipper of the local schooner, his weather-beaten face plainly showing the stress under which he was laboring, described in husky tomes yesterday afternoon the loss of his four men. Racing under bare poles before a 90-mile gale near Sable Island at 8 0’clock last Thursday morning, a great sea struck the craft, sweeping her from stem to stern. Driven on beam end by the smothering wave, the Howard shipped a lake of green water from leeward. Of nine of her crew who were then engaged in trying to lash the foreboom, four did not reappear from the welter of the sea. They had been carried overboard to their death. Their cries were faintly heard through the storm, but their mates, devoting their whole effort to saving their craft from sinking, were powerless to aid them. Battered by the storm, the Howard was only a plaything for the gales and high seas. Not a stitch of canvas could be set; it was futile to attempt to throw out anchors to check her course straight for the sandbars of Sable Island. 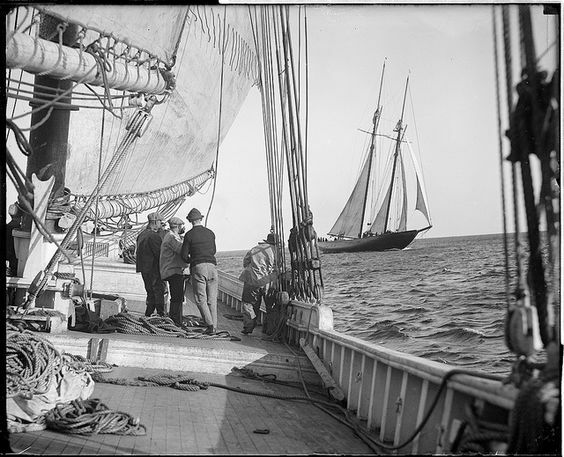 For hours the gale drove the Gloucester schooner straight towards the bars. Then just when the crew, exhausted and short-handed, had almost given up hope, the wind abated and the men were able to set a reefed foresail and the schooner sailed away from the menacing lee shore. Friday morning the Howard encountered the Helen M. Coolen, battered and sinking. The Coolen, too, had lost men in the great gale. The Nova Scotian parted her hawser from her anchorage on West Bank. When the crew tried to set the trysail, the gale blew it to pieces. As the men attempted to lash what remained, a huge comber broke over the schooner’s bow, raced aft and washed overboard Steward Boutillier and Joseph Laut, both of Hubbards, N. S. They were never seen again. When Capt. MacDonald was told of the plight of the survivors of the Coolen, he offered to take them off. The Nova Scotian’s scams had worked open in the gale and the deck planking was spring. She was taking water much too frequently for the efforts of the weakened crew. The 16 survivors of the Coolen left their wallowing craft and rowed their dories through the heavy seas to the safety of the Howard. The Coolen foundered shortly after.